All of the SCI games are created by combining a number of different resources. Each resource is basically a file containing a portion of your game. Whether it's a room picture, animation, sound, font, cursor, script, or message file, they all work together to make a game. SCI has a number of different resource types and all of them can be created and managed using SCI Companion. If you haven't already, download the latest version from here. Once Troflip has released a final version you will be able to find it on the SCI Tools page. Now then, if you are ready to begin, let's go over the different types of resources that are used. 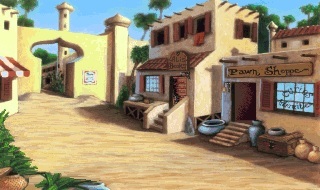 All of the background images in SCI games are made up of pic resources. These images are bitmap images usually with a width of 320 and height of 190 pixels. They can be created using almost any picture editing software and imported directly into SCI Companion. The view resources act as the animations or other static images which are applied or added to the background pic resource which bring your game to life. Scripts are the heart of your game. They contain the code which handles all of the elements of game play. To make your game actually do something, you'll need to script it. 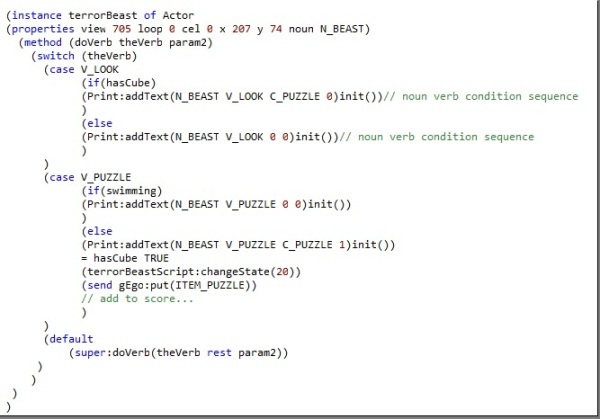 To script a game, you write code in the script resources. The code in your scripts will allow the game to react to things the player interacts with, place views, trigger sequences, make sounds, display animation, and everything else. As this is a tutorial teaching you how to make a simple game, there are a large number of elements of the SCI language which you will not need to know. This will teach you everything you need to know to finish this tutorial and make your first game.